What a way to start your morning with this great Wild Huckleberry combination! 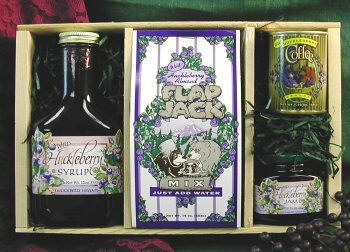 This hand crafted custom gift crate includes: Wild Huckleberry Coffee, Jam & Syrup as well as Wild Huckleberry Almond Flap Jack Mix. Create a breakfast sensation with this Wild Huckleberry Breakfast Crate. Hand crafted custom crate makes a perfect gift for any occasion. Great for corporate gift giving too!